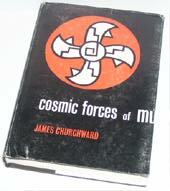 COSMIC FORCES OF MU, Volume 1 is the fourth book in the famous MU series by Col. James Churchyard who spent his lifetime researching the vanished Pacific continent and super-civilization of Mu. In this volume the author explains the sciences as they were taught in Mu -- teachings the author felt were far in advance of present knowledge and embracing the whole universe. A force is that which makes changes in the position of bodies, and sometimes changes in the body itself, No body or matter, however infinitesimally small or ponderously large, can make any change without the aid of a force. All forces known as atomic forces are only secondary forces governed by some superior force. The superior force moves the atoms and the atoms produce or convey another or secondary force-the superior force is the responsible one. There is one great infinite force that governs all. Thus begins the exploration of the Cosmic Forces and the orderly procession of powers creating the Universe, the Earth and which forever cause change. Inbunden, 264 sid., utg. år 1992. OBS på engelska!